After a long (albeit wonderful) Thanksgiving holiday weekend packed with tons of cooking, I yearn for a simple dinner recipe that requires minimal prep and dishwashing. 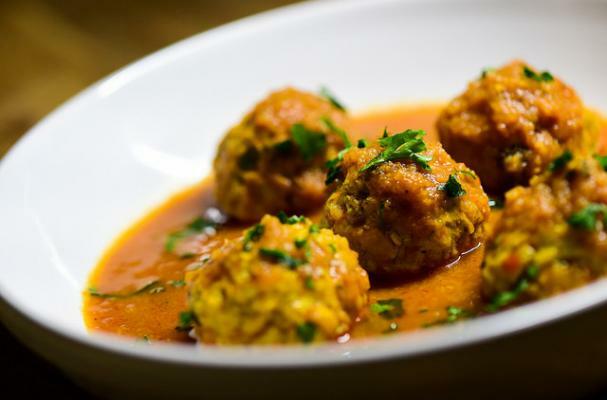 These easy Curried Chicken Meatballs from Chef/Restaurateur Hari Nayak are full of flavor and aromatic spices yet takes less than 30 minutes to make. Ground chicken is combined with freshly chopped cilantro, onions, fresh ginger, garlic, bread crumbs, and egg then formed into meatballs. The curry sauce is a fragrant blend of sautéed onion, finely chopped tomatoes, tomato paste, ginger, and garlic that is reduced down to a paste. Finally, along with a bit of water, curry powder is added to the paste, melding the flavors together to create a luscious sauce. The meatballs are added to the skillet and covered for about 15 minutes until the dish is done. Serve it with fluffy basmati rice and a side of cucumber mint raita. In a large mixing bowl, combine the ground chicken, half the cilantro, half the onions, one tablespoon of minced ginger, one tablespoon of minced garlic, egg, bread crumbs and salt. Mix well using your hands. Dip your hands in water and form about 30 meatballs, each about the size of a golf ball. Place on a prepared tray, cover with plastic wrap and place in the refrigerator for 15 minutes to chill. Heat the oil in a large, deep nonstick saucepan over medium heat. Add the remaining chopped onion, and cook stirring often until the onion is golden brown, about 5 minutes. Add the finely chopped tomatoes, ginger, and garlic to the pan. Cook stirring over a medium heat until the oil comes to the surface, about 7-8 minutes, then add 1 cup of the water and continue cooking until all the water has evaporated. Stir-fry this paste for about 3 minutes, and then add the curry powder and salt. Add the remaining water, cover, bring to a boil, and simmer for 5-6 minutes. Add the meatballs to the pan, cover, and simmer for 15 to 20 minutes, shaking the pan every so often; but do not stir, as the meatballs could break. Add the remaining cilantro, stir the meatballs gently. Serve hot.